From the outset, Melbourne-based gypsy brewers Hawthorn pitched themselves as the "Flavour Merchants", complete with a website that nods visually to days of the British Empire and speaks of "intrepid explorers scour[ing] the beer world, risking life and limb to bring home the secrets of its best brewers." It's all rather exotic sounding, whereas in reality they have found success here and overseas with beers of a more broadly crowd-pleasing nature: Pale Ale, Pilsner, Amber, Golden, IPA. Sure, inspiration for some of those beers comes from the US and Europe, but how intrepid one has to be to end up with such a quintet we're not so sure. So could it be that their third Brewshed release (brewed with their mates at Blackman's in Torquay) is the most Hawthorn beer yet? 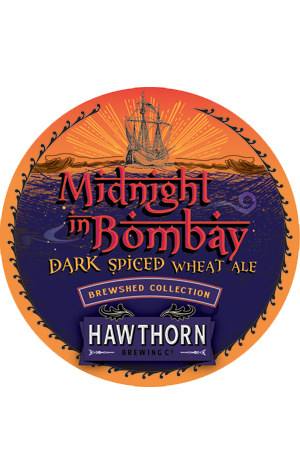 Inspired by brewer Hamish Reed's recent trip to Mumbai and Goa – and a desire to create something a little different for GABS – they came up with Midnight in Bombay (which to this writer brings back memories of a disagreement with a rickshaw driver who threatened to dump him in a Mumbai slum...). The beer is, thankfully, rather less confronting than that late night misadventure, instead described as "smooth and dry", pouring dark with "a hint of deep ruby red" and adding some less the typical ingredients to the roasted malts and wheat beer yeast. They include smoky black cardamom, cloves, coriander seeds and green cardamom pods, with this melange of ingredients lending the beer, according to Hamish and his cohorts, "smooth aniseed and cocoa flavours", "roast complexity" and "a light citrus flavour". They conclude: "Complex, but balanced, it complements similarly spiced food, smoked meat or even a chocolate dessert."